These odd little water dwellers aren’t that frightening to look at. They just look like frogs wearing hats! However, whilst sometimes just peaceful puddle lovers, they can be mischievious and even murderous if you get on their rubbery backs. Come up against an angry kappa in the water and it could be curtains for you. They’ve been known to rip off the arms of their targets, and especially favour drowning swimming women. They also have a vendetta against cows and horses for some reason. Potentially, they’re jealous of their hooves (no one wants a webbed foot). Kappa are considered very intelligent in the world of Japan’s monsters- they can wrestle, irrigate farmland and even speak Japanese. They can be pacified by hurling a cucumber into the water with the name of the swimmer etched into the flesh- a practice which continues in Japan until this very day. Alternatively, if you come across a Kappa on the riverbank, offer him a deep bow which he will subsequently return, then chuckle as his hat falls off and the water in his head spills out. Supposedly, if you refill his cranium with water from the river and pop his little hat back on, he’ll be so grateful that he’s yours to command! Want to know what a kappa feels like? We reckon it’s something like this dashi kelp. This cheeky rascal is most menacing in an oddly specific way. The Makura Gaeshi dedicates his life to mildly interfering with your sleep. Does he slip in at night unannounced and pluck out your hair? Does he take unflattering, under-chin, mid-snore photographs and upload them onto Facebook? Does he whisper nasty put downs, affecting your sleep quality and general self confidence the next day? Nope. This guy dotes his nasty little life to… moving the pillow. That’s right, whenever you wake up and the pillow is inexplicably in the deepest darkest crevice of your bed or futon, where only your feet and perhaps your neglected teddy bear should dwell, that’s the Makura Gaeshi. What a ragamuffin! We’re not quite sure why this chap gets quite such a kick out of slightly moving the pillow- perhaps he’s secretly in cahoots with the tooth fairy. Regardless, this is one creepy creature that we’re sure will be causing you sleepless nights for many many moons. 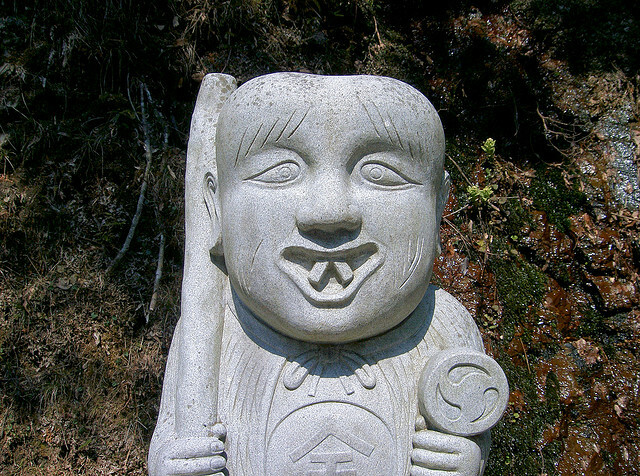 The Konaki Jiji resembles something between a horrid baby and a horrid old man. Like many monsters inhabiting Japan, he carries out his dastardly schemes in a rather elaborate manner. This infant-pensioner hybrid lurks in the woods, waits for an innocent rambler to come along and then begins to weep to high heaven. The surprised wanderer inevitably ambles over to the sound, feels sorry for the unidentified creature, picks him up and gives him a reassuring cuddle. In an ingenious, heinous and physically mystifying move, the old man-baby decides to increase his weight by around one thousand percent, which crushes the rambler to death! Our advice is, if you see a baby with a face like Prince Phillip dwelling in the woodland, don’t stoop down or you might do your back in. We’ve also heard the Konaki Jiji has an insuppressible sweet tooth, so consider stocking up on pocky, strawberry kit kats or gummy candy before your next rural romp. 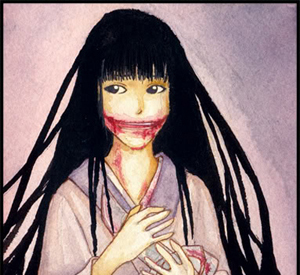 Not so much a monster as an urban legend, Kuchisake-Onna is nevertheless included because she really gives us the heebie-jeebies. She is a woman whose mouth is slit from ear to ear, and roams about wearing a surgical face mask (not that uncommon in Japan) full of vitriol and hatred. Armed with a bloody pair of scissors, she corners her victims- usually kids- in the dark places of the world. Then, she takes off her mask and asks rather a loaded question: “Am I pretty?” Tricky to answer at the best of times, this becomes almost impossible to retort to when facing a monstrous hag pointing her snippers at you. If you say “yes,” she’ll do you the disservice of slicing your own mouth, so you too bear a terrifying red grin. If you say “no,” she won’t just go off in a huff, she’ll kill you right there and then! So what to do? Rumours abound that to escape this scary lady, you either have to say something along the lines of “well, you’re alright, nothing special really. Kind of just average. A resounding 5 out of 10” and then leg it whilst she gets confused. Alternatively, simply ask her the same question: “Am I pretty?” Don’t expect her to start dishing out compliments, but she might pop away her scissors and go off somewhere else. You know that skeleton in science class that always gave you the creeps? Well imagine that, but 15 times larger. And made out of dozens of dead bodies. With a tendency to follow you at night time. And a desire to bite your head clean off. That’s the Gashadokuro! “Crikey,” you must be thinking, “no amount of bunsen burners would protect me from this enormous bony foe!” Indeed not fair reader, for these are some of the most ghastly creatures in Japan. So how did these rattly big boys come about? When large amounts of people died during warfare, plagues and whatnot, their bodies were not properly tended to and their fury and dissatisfaction lingered. This dark energy subsequently swirled all the bones together to make the Gashadokuro, who then roams about at night looking for solo travellers to chomp on. Naturally. 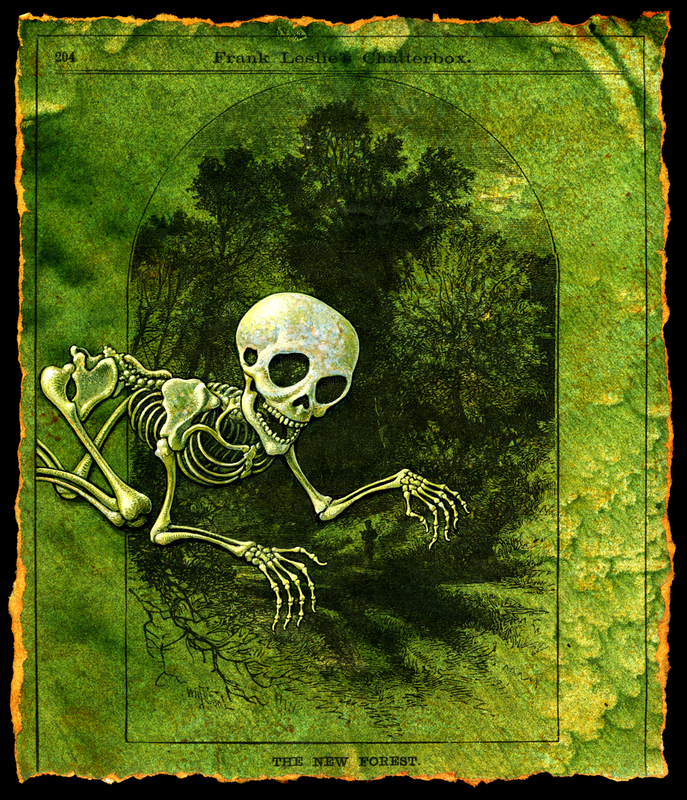 We’ve had word that you can hear the ‘gasha gasha’ sound of rattling bones just before this monster strikes. We reckon giving these soda drops a vigorous shake will have the same affect, why not sneak up on your mates and give it a try? Any of your favourite Japan monsters that we’ve missed out? Let us know in the comments below. Having a haunting Halloween party? Celebrate in style with our selection of Halloween goodies at Japan Centre! 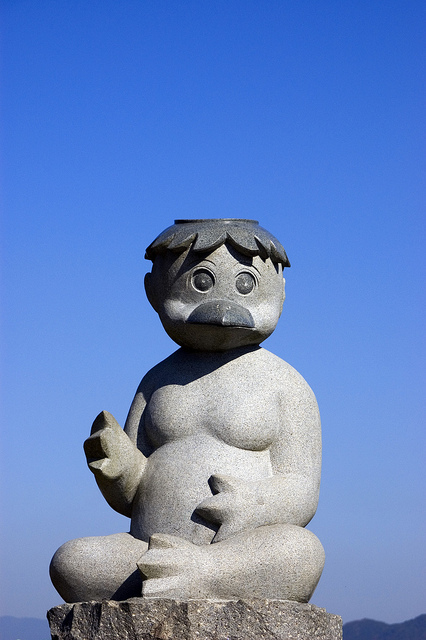 Thanks to Brian G. Kennedy at flickr for the Kappa statue image. 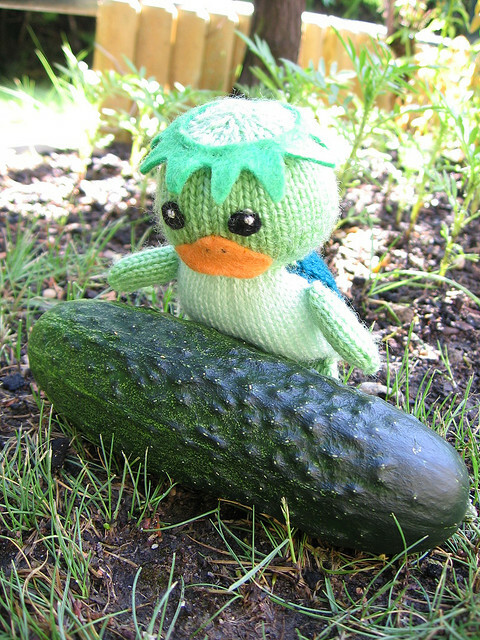 Thanks to Elise at flickr for the knitted Kappa image. 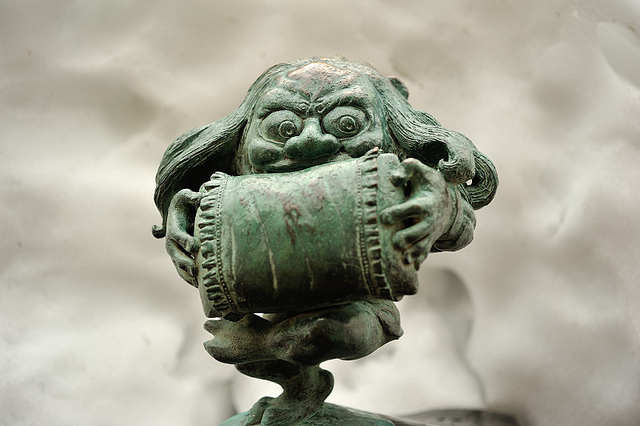 Thanks to Akaryn at flickr for the Makura Gaeshi statue image. 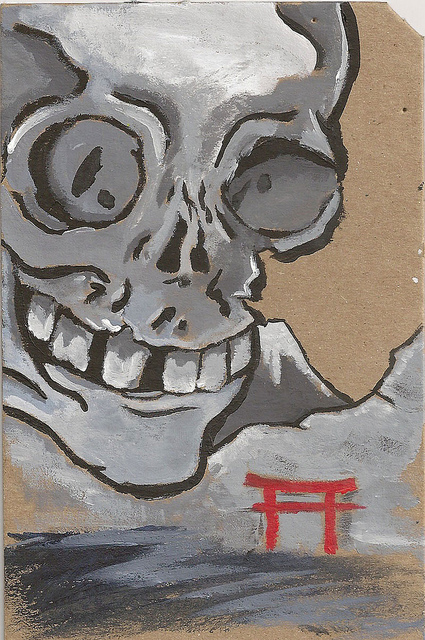 Thanks to Kubikajiri at flickr for the Makura Gaeshi painting. Thanks to Angel Lahoz at flickr for the Konaki Kiji Statue. 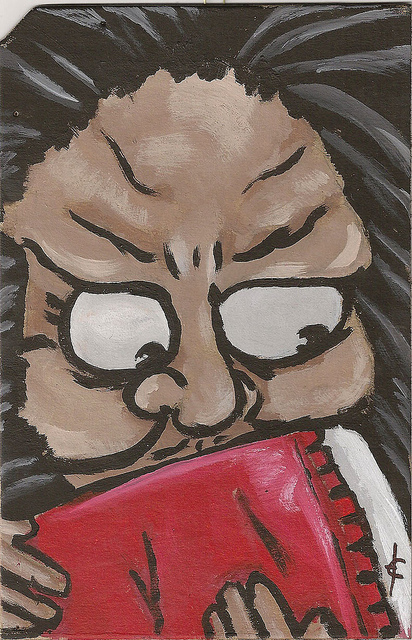 Thanks to Achmad Sauqy at flickr for the Kuchisake-Onna Cartoon. Thanks to Leah Palmer Press at flickr for the Gashadokura image. Thanks to Chris Kubakijiri at flickr for the Gashadokura and tori shrine image. Posted in Uncategorized and tagged halloween, japan, Japanese monsters, Top 5, top 5 monsters in japan. Bookmark the permalink.